The mission of the Friends of Mueller State Park is to support and advocate for Mueller State Park (MSP). The Friends will work with Park staff and community partners to promote educational and recreational activities and assist with the effective management of the natural resources of MSP. We act independently to raise funds to support MSP projects, to serve as advocates for critical issues and to preserve the history and culture of Mueller State Park. 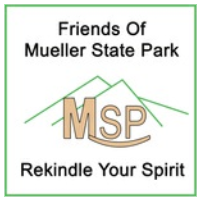 The "Friends of Mueller State Park" (FOMSP) is a non-profit 501c3 group that raises money to fund special projects and interpretive exhibits to enhance the experience of every visitor who enters the park. All members are volunteers and the FOMSP have no paid staff. All donations and grant money supports park projects. Mueller State Park is a Colorado state park encompassing 5,112 acres of land outside Divide, Colorado,northwest of Colorado Springs, Colorado.